"If you want to dramatically increase your sales, you need to be a student of sales. 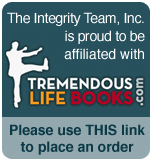 The Integrity Team will teach you what you need to know to be an expert in sales. Even one idea, one tweak in your style can be a game changer that multiplies your commissions many times over. " "In my twenty-two year of career selling, I thought I had mastered selling to a level in which many people would never have the opportunity to achieve. The eight weeks of Integrity Selling has humbled me and made me realize that throughout my sales career, I could have achieved greater levels of success my mastering behavior styles taught through this system. By practicing the selling system, mastering the ability to identify behavior styles and understanding the sales congruency model, I see greater opportunity in the future. Thanks for being a great teacher!" "You have been instrumental in organizing, training, and mentoring our sales team for many years. You reach beyond the one or two day training ‘events’ to coach our sales professionals to the create habits they need to be successful. They include the core principles of human interaction, and personal motivation, which are the basics of all true selling. You have been patient, persuasive and persistent in your commitment to insure that each individual grasps and utilizes the elements needed to succeed in his or her chosen industry. I am confident that anyone who enrolls with you, follows your guidance, will not only accomplish their goals but will also enjoy the process." "We started seeing results before this course was even over. It’s not only information and techniques but a philosophy as well. Thank you for putting money in my pocket. That is exactly what your course has done." "We investigated numerous training systems before enlisting your services. The results of your carefully customized total quality training system exceeded all of our expectations. After your last session I asked our sales associates to evaluate the eight months you spent with us. Although these expressions of what I deem remarkable successful program describe your huge contribution professionally to our organization, they do not express the difference you made in our lives. It would be a disservice to you and your prospective and future clients, Phil, if I failed to share that is was YOU who made the difference between simply ‘teaching’ us versus ‘transforming’ us! A program with you, Phil, is a gift for life!" "In my twenty-two year career of selling, I thought I had mastered selling to a level in which many people would never have the opportunity to achieve. The eight weeks of Integrity Selling® has humbled me and made me realize that throughout my sales career, I could have achieved greater levels of success by mastering behavior styles taught through this system. By practicing the AIDINC® selling system, mastering the ability to identify behavior styles and understanding the sales congruence model I see greater opportunity in the future." "We have now completed the initial phase of the Integrity Selling® program and I must say that I am delighted with the program. I am also proud to report that it really has happened! Our closing rate and volume have both jumped 15% at a time when we have seen many of our competitors complaining about lackluster business conditions. We are not seeing more customers coming through our doors, we are simply selling more of those that do come in. (It is wonderful to see an increase that is not fueled by increased advertising expense.)" "We were fortunate enough to be selected to facilitate Integrity Service® program for our company. This program has benefited our company by making our associates realize not only that we have external customers, but internal customers as well. We have seen amazing behavior change from the participants who have graduated from Integrity Service®. The repetition of the course principles and the reinforcement and encouragement from associates and management has created this behavior change ." "It was a memorable summer. The highlight of course was Integrity Service® . In today's tight job market, it is more difficult then ever to retain good people. I am pleased that because of the improved work atmosphere I have only lost one person, and that was because her spouse was transferred out of state. I have also promoted four people in the last 3 months. I believe Integrity Service® has played an important role in their improved effectiveness." "Very thought provoking! Learned to look at some ideas differently. I plan to use QBQ to ask better questions: Especially, in the area of customer relations. I also plan to incorporate service leadership into work." "Our company is pleased to inform you that in a recent ceremony, we were selected as the 2002 US. Senate Productivity Award winner for the State of Maryland. Our company takes great pride in winning this award, we believe that our achievement could not have been realized without the excellent support and training provided by The Integrity Group. Specifically, the management and leadership development courses provided by your company." "Upon recently completing the leadership program, I am compelled to express my gratitude and appreciation for your efforts in facilitating this most interesting program. Not only does the course material apply directly to my daily management responsibilities, but I found that the principles may also be utilized in my personal life as well. With so much importance on balancing career and family, I discovered the ease with which the foundations build upon each other and apply to all facets of life." All testimonial references are available upon request.